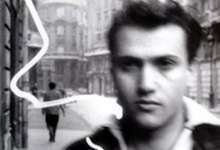 Isidore Isou arrived in Paris from Romania in 1945 where he founded the Lettriste movement and published many books. Letterism attempted to break down poetry into letters and syllables, and then all arts into their constituent parts, to build up new languages for each art form. 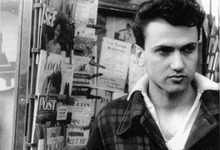 LE TRAITE DE BAVE ET D'ETERNITE (On Venom and Eternity) was the first Lettrist film manifesto. Isou brought it uninvited to the Cannes Film Festival (1951) where it won the audience prize for the avant-garde. Jean Cocteau's poster promoted the 1952 release on the Champs-Elysées. The film is Isou's "revolt against cinema": the sound and the picture are purposefully unrelated, and the images are destroyed by bleach and scratched. The film is a landmark work that prefigured the letterist and situationist cinema to come and influenced many experimental filmmakers. "The greatest filmmaker of all time... ISOU is the leader of our generation."